Just as there a many different types and shapes of closets, there are many kinds of closet organizers available to suit the needs of any home. Closet organizers have flooded the home improvement market in recent years, so there are a plethora of options available from custom to do it yourself systems. Well-made built-in organizer systems increase storage and keep the closet organized. Many include adjustable rods and shelves so they can be modified to change with the needs of the user as clothing collections expand. Budget-wise, permanent closet organizers initially cost more, however, is typically a more financially cost-effective option versus DIY kits, ventilated wire, and a host of organization racks which may work in the short-run but will need replacing as time moves forward. Closet Factory offers closet organizer systems that are custom-made based on a collaborative design consultation that identifies what to store in the closet, what components to include, and what price range to work within. The designer can also help create the style so that it complements the look and feel of the home, and ensures that it suits the needs of the users. 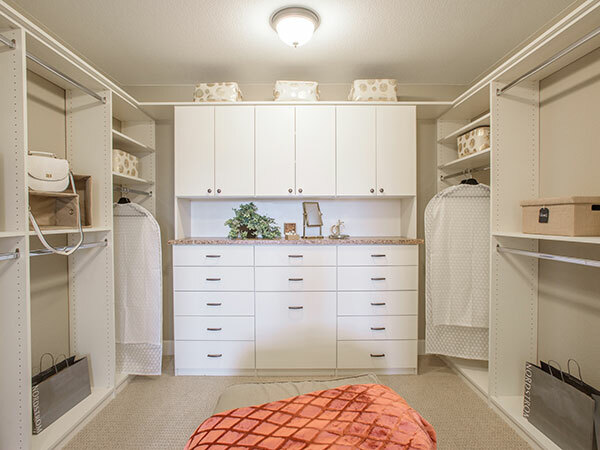 Adding closet organizers is a trend that has been on the rise for some time with the ultimate goal to increase storage capacity by including a system that will best suit the needs of the homeowners. The designer works with the end-user to choose the sections, double hanging, single hang with shelves, shoe shelves, drawers or baskets with cubbies above, that will allow for the best design configuration adding storage and organization to a closet. Sketches and digital designs offer mock-ups that can make the process simple and easy to visualize what the finished layout will look like. Height, width and depth should be considered based on what will be put in the different sections. When considering the budget, modifications can be made to the design, accessories, and materials to scale the cost up or down. The first step to designing any closet organization system is to develop a well-thought out plan. 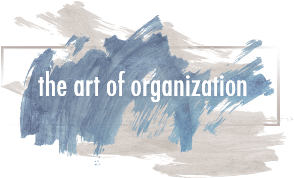 Your designer will help you develop a plan of action that considers all the elements that you’ll need to consider before building out a system. A design consultation will also offer insight into what you will really need, while taking into account the space in height, width and diameter. While our recommendation is a permanent solution instead of a temporary one, your closet organizer can be customized to suit your exact needs for the present as well as the future. You’ve likely spent thousands of dollars on your wardrobe over time, and as such, you’ll want to ensure that you’re safeguarding your precious items. It’s a proven fact that apparel lasts longer when properly cared for, so a closet organizer will help you protect your investments. Your initial task will be declutter your wardrobe and decide what your closet organization system will house, and then you’ll want to determine how much hanging space it will require and the amount of folded item space you’ll need as well. Also consider space for shoes and accessory items like jewelry, hats, ties and belts. Your designer can help you select the best options to truly maximize the space. During our free consultation process, we help you with your planning needs and take inventory of your wardrobe. We’ll take into consideration all of your requirements, and offer suggestions for materials and embellishments to truly make the space your own. Once we’ve determined a strategy and design, we’ll also provide a free quote which provides a general estimate of the final cost that determined after the full design of the closet organizer project. We take your budget into consideration and offer guidance for the ideal solution including three different price levels so that it remains in your comfort zone. Accessories are the perfect complement to any outfit, and as such we understand that you’ll want to keep them close by for easy access. Our designers can recommend the perfect closet essentials for your accessories. Baskets, shoe racks and tie racks are the perfect options to maximize space and house your items. While these are add-on features for each closet organizer, they are not sold separately so they will be included in your design process. You’ll be able to quickly grab each item before stepping out of the house each day. Creatively speaking, your closet organizer can be tailored to suit your specific tastes. With a wide variety of colors, textures and lighting options, we can design a system that’s most ideal for you. Consider selections like wood paneling or melamine for the build out of the final product, while adding LED lighting can help illuminate specialty items. Don’t skip out on embellishments like crown molding as they can enhance the look and feel of your closet organization system. The options are truly limitless when it comes to closet storage design. 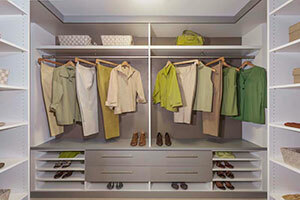 Master walk-in closet organizer system includes plenty of drawers to free up floor space in the bedroom. 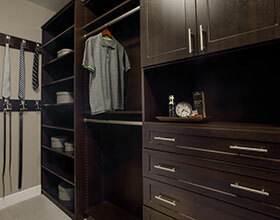 His closet features masculine colors with Shaker style fronts and specialty tie organizers on the wall. Closet organizer combines drawer sections, double hanging and shelving for storage. 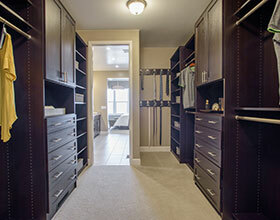 Generous walk-in closet is maximized with organizers on all the walls. Folded space is covered with shaker doors for an upscale style. 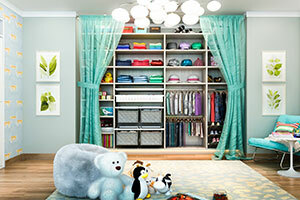 Visit the custom closets gallery and view pictures of closet organizers.